9 Responses to Isn't that redundant? I don’t think I have ever seen a big bad hummer in comics……..
And as for Marvel/Sesame Street crossovers…I quite like that idea. Dr Doom and the Cookie Monster duetting on “D is for Death Ray” would be a highlight. 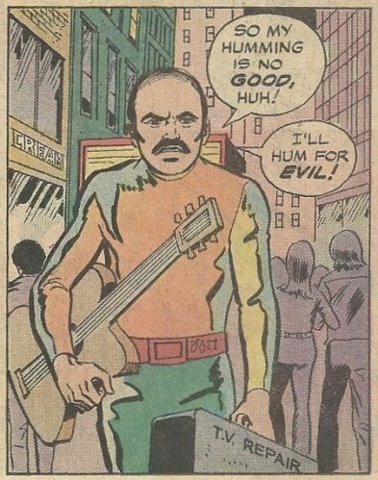 I swear that character strangely looks like G. Gordon Liddy. So, is that how he got his start in political commentary? A failed attempt at humming? I loved Spidey Super Stories! Those comics were so much fun. Jeff Hebert: I loved Spidey Super Stories! Those comics were so much fun. I did too. They were my official introduction to comics as a kid. Hmm, I wonder if that was Marvel’s idea all along. He reminds me of the “Micro Machines” guy. Was that it? His trigger was no one listening to his humming, so he decided to dress in a mechanic’s suit and talk really fast? Or was meth involved? This isn’t all that impressive, ya know. It’s rather humdrum.